Apple CEO wasn’t just showing off recently when he rattled off company figures during his company’s Q4 earnings meeting. Steve Jobs berated RIM in that meeting via a conference call saying Apple has passed them by and now its has been proved in the IDC report released today. 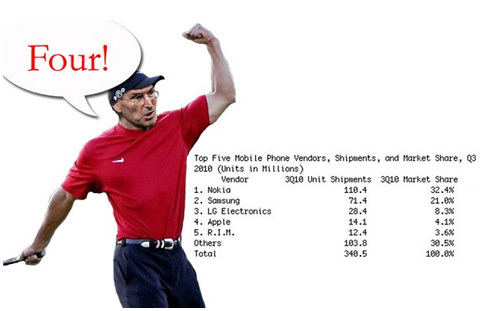 According to IDC’s data, Apple is now the 4th largest mobile seller in the world, finishing ahead of RIM in the top 5 list. It is now shipping 14.1 million phones every three months. Though Apple still remains behind the market number one Nokia and Samsung and LG which stand at 2nd and 3rd spot respectively, it is showing sustained market growth and is expected to grow even more in the coming years. IDC reports that Nokia slipped from 36.5 % to 32.4 % market share since the same quarter last year and is beginning to lose its hold in emerging mobile markets. Nokia has also suffered some loss due to the emerging Android market and it still has to gain the smartphone market back. LG is also reported to be suffering with a 10.1 decline in shipments since the same quarter last year, dropping from 10.6 % to 8.3 % globally. It’ll be interesting to see how long it takes Apple to get in to the top 3 and who will it be that takes a tumble from the list. With a world getting obsessed with smartphones, this may happen sooner than later.